Everyone knows those evenings when you prefer to stay for a beer longer, sitting at the bar and losing yourself in your thoughts. You should probably go home or least push on, however as the world and life drift past, you drift into a quietness. The Hamburg based band, The Golden Creek, have come up with just the right soundtrack for this feeling. Their first EP, Everything Falls Apart, certainly tells us that in the end everything turns out differently than you thought it would. With his soft, slightly husky voice Matthias Abel sings of finding love: "You're running, through these streets waiting for someone you would not recognise. Searching for something, that by searching you won’t find" and helps captures a feeling, all to familiar to the souls of lost city dwellers. The song is called She Cares For You and we are left to wonder whether the protagonist found his happy ending. This uncertainty accompanies the six-piece band alongside its acoustic guitar and three vocals. The band puts together songs with both unexcited and soulful tones. Their recognisable character is achieved through the versatile influences of The Golden Creek’s band-members. The authentic Americana sound of their EP is in part thanks to the lap steel and guitar from Axel Lemmerz, while Mark Kenny’s banjo lends the songs an Irish soul and conjures up a unique country sound. All this, together with the double bass from Malte Mertz and Josef Abel’s piano and organ, allow The Golden Creek to warm and quicken the hearts of Wilco, Ryan Adams and Jeff Bridges fans. Those who believe The Golden Creek might just be another hip indie-folk band, with guys in skinny jeans, are greatly mistaken. Anyone who has experienced The Golden Creek live, know that they are a band not interested in new trends, but rather simply about writing good songs. Together they arrange stories, which tell of love, life, aging, hope and their own past. 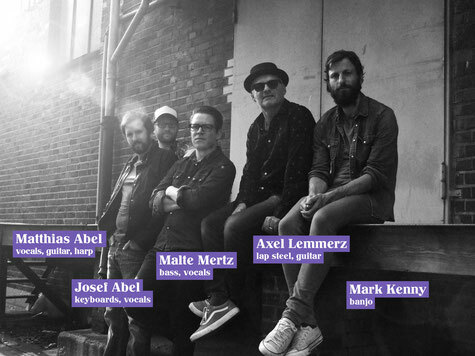 A past they’ve also shared, the brothers Matthias and Josef Abel have grown up playing music together. While singer and bassist also share years of both friendship and music. It could be this shared life that lends The Golden Creek its depth. Even if most of the band members are still too young to begin looking back and reminiscing on their memories, they do so anyway. As it is sung on the title track Everything Falls Apart, "Things get lost along the way, turn into memories that will not stay, but be at peace, don’t fear to let them part”. This is about dashed hopes, impossibilities and about learning to make peace with them. It is about letting go without breaking apart. This sentiment resonates throughout the entire album. Nevertheless, this EP leaves its audience with the feeling of warmth, that there's light at the end of the tunnel and while we’re making our way there, we still have time for one last drink.